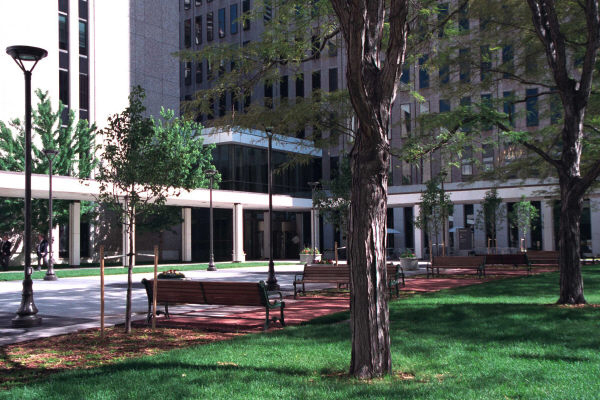 The area around the federal buildings in Denver was viewed by visitors as confusing in terms of knowing where different buildings were located. In addition, these buildings were also perceived as a “block” between the downtown business district and a residential neighborhood. PPS worked with the General Services Administration (GSA), local designers and area stakeholders to create a concept for the federal district, as well as on changes that could be implemented in the short term that would make the area a friendlier, more pedestrian oriented place. These changes included both physical amenities such as benches, plantings, lighting etc. but also ideas for improving the management of the public areas. One important outgrowth of this effort was the establishment of the ambassador program in which a GSA “ambassador” answers questions, helps people who are confused, and forges ties between the adjacent community and the new district.